Heat oven to 375°F. In medium bowl, stir cookie mix, butter, flour and egg until dough forms. Roll dough on floured surface until about 1/4 inch thick. Cut with 3-inch round cookie cutter. Place 2 inches apart on ungreased cookie sheet. Carefully insert a wooden stick into side of each cookie. Bake 9 to 11 minutes or until edges are light golden brown. Cool 1 minute before removing from cookie sheet. Cool completely, about 30 minutes. Divide frosting among 4 small bowls. Tint frosting in 3 of the bowls with different color of food color. Reserve some of the tinted frostings for piping on designs. Frost cookies with remaining white and tinted frostings. For piping, place each tinted frosting in small resealable food-storage plastic bag; snip off tiny corner of bag. Pipe frostings on cookies in desired designs. Decorate with candy decorations. 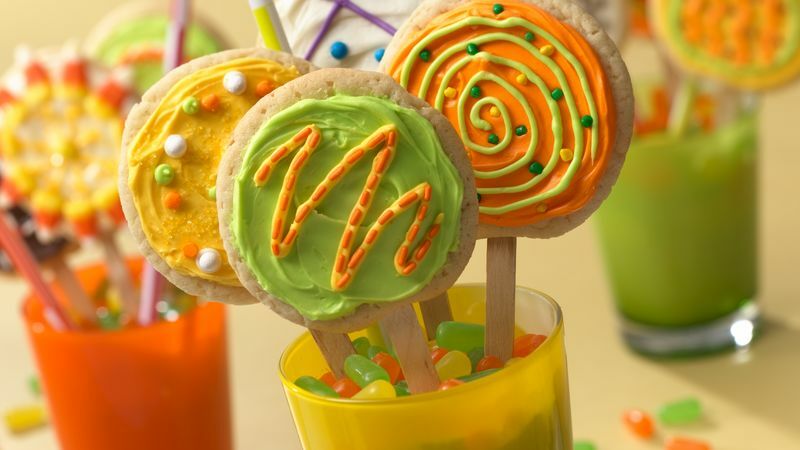 Serve cookies from glasses in coordinating colors. Fill the glasses with jelly beans to hold the cookie pops upright. You can tint the frosting with either liquid or paste food colors. You may like to try the newer neon liquid food colors. Paste food colors will give you very vibrant color.